Olive oil is among the healthiest, most versatile dietary oils in the world. Here are seven ways that olive oil supports good health. Olive oil is high in fat, but that does not mean it's bad for you. We still hear from people who think a low-fat diet is the goal. It's not... going too far in the low-fat direction puts you at risk for blood-sugar problems and chemical imbalances that can contribute to heart disease and Alzheimer's. Your body needs fat! It just needs the right kind of fat to thrive. And olive oil falls into that category. You've heard that eating too much fat can give you high cholesterol. But olive oil actually improves your cholesterol levels because it contains primarily monounsaturated fatty acids. These fats can bring down your total cholesterol levels and lower your LDL cholesterol – that's the "bad" cholesterol associated with heart disease. Research also suggests that olive oil helps keep your body's clotting mechanism in balance. It's one more way that olive oil can help you avoid a heart attack. The healthy fats in olive oil may also help protect you against type 2 diabetes. And if you already have type 2 diabetes, olive oil may help you keep your condition from progressing by regulating both insulin response and blood sugar levels. Olive oil contains high levels of oleic acid. This level of oleic acid has been associated with lower risks of some cancer. Olive oil is a great natural source of vitamin E. A tablespoon contains almost 25 percent of the Recommended Daily Allowance. Vitamin E supports healthy cell membranes and healthy skin. It's also a good source of vitamin K, which promotes good bone health and helps to protect the brain from Alzheimer's disease. Another compound in olive oil helps control blood pressure and improve the health of the arterial lining – both important factors in reducing heart disease risks. Polyphenols actually reduce your risk of heart disease on a genetic level. They affect genes linked to heart disease risk in a positive way. But with all of it's benefits, olive oil has a dark side. Don't wreck the health benefits of olive oil. Olive oil is fairly fragile. It can begin to break down because of light exposure. 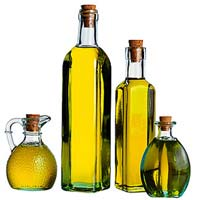 Store your olive oil in a dark bottle in the cupboard or pantry. It may look pretty on your windowsill, but the sun will make it taste funny and weaken the nutritional impact. When stored in a cool, dark place, olive oil will keep for a year, but you'll never have a year-old bottle sitting around if you make this superfood part of your regular diet. Don't cook at high temperatures with olive oil. Use it for salad dressings and in other cold foods. You can also do a quick sauté with olive oil. When olive oil reaches high temperatures, the fats begin to oxidize, creating free radicals, and they also hydrogenate, creating harmful trans fats. For cooking at higher temperatures or for a prolonged time, choose coconut oil, another oil with big health benefits, because it can stand up to the heat. Most olive oil sold in the store is a total waste of money. The bulk of it doesn't contain the polyphenols and other compounds in the levels needed to enjoy the full health benefits. What you want is extra-virgin olive oil that has a harvest date on the package. The oil will stay at full potency for two years, but look for the freshest olive oil you can find. Besides freshness, a number of factors affect the quality of the olive oil you buy. Harvesting methods, the ripeness at which the olives were picked (green olives have more polyphenols than ripe olives, but the oil is easier to extract from ripe olives), and processing methods can all change the nutrition profile of olive oil. UC Davis tested a variety of extra virgin olive oil brands for quality and found these brands to be consistently the best: Corto Olive, California Olive Ranch, Kirkland Organic, Lucero, and McEvoy Ranch Organic. Fresh, extra-virgin olive oil packs a powerful punch when it comes to health benefits. But it's easy to get fleeced into thinking you are getting benefits when you're actually wasting your money on standard-issue oil being passed off as something it's not. You can enjoy high-quality olive oil that tastes great and is known to significantly reduce your risk of heart disease, cancer, and Alzheimer's. Just know what to buy first!